A new study, published online today by Amander Clark, Ph.D., at the UCLA Eli & Edythe Broad Center of Regenerative Medicine and Stem Cell Research, significantly furthers the understanding of the human germline – the cells that create eggs or sperm in humans during prenatal development in the womb. The highly specialized cells of the germline, called germ cells, are the only cell type in the body capable of passing parents' genes on to their biological children. Abnormalities in the germ cells can cause infertility as well as diseases such as germ cell tumors in young boys and primary ovarian insufficiency in young girls. 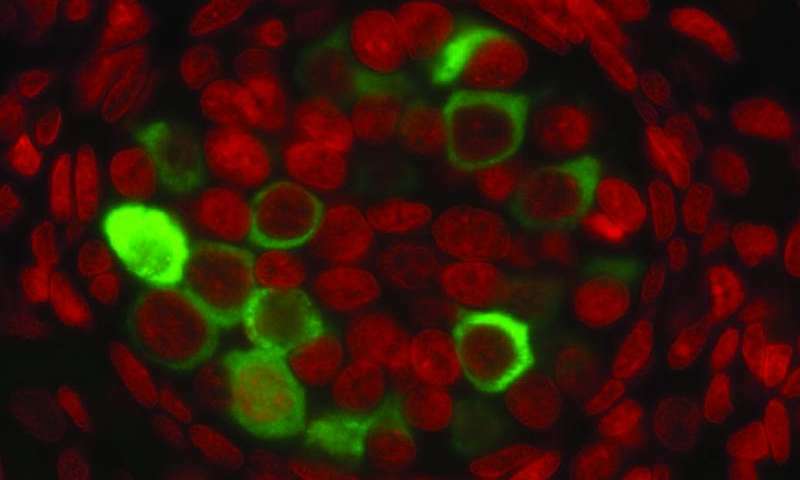 Published by the journal Cell, the study looks closely at how the genetic information of prenatal germ cells is shielded from harm during prenatal life, showing that these important cells lack protection during a phase of development, leaving them vulnerable to damage. "My overall research goal is to understand the causes of human infertility, so taking a close look at how germ cells develop in the embryo is crucial," said Clark, associate professor and vice chair of molecular, cell and developmental biology in the life sciences at UCLA. "We know very little about how prenatal germline cells are made in the body; I am working to understand what they are sensitive to during development and what is protecting them from external environmental factors that could cause them to not work properly." A biochemical process that is crucial for protecting human genetic information, commonly known as the genome, is called methylation. All healthy cells in the human body are methylated. Methylation acts as a protective coat on the genome that safeguards cells from mutations. If cells don't have methylation, the genome is vulnerable to damage. Methylation removal, called demethylation, happens very infrequently in the human body. One such time is during a short period of time in prenatal life during pregnancy. This period of germ cell demethylation was the focus of Clark's study, which mapped the amount, duration and location of demethylation in prenatal germ cells from 53 to 137 days of development. The study found that the human germline erases almost all evidence of genome methylation by 113 days of prenatal development. Importantly, while a large amount of demethylation did occur, some areas of the germ cells retained a small amount of methylation. "The quality of a person's germline cells, which are created before they are born, is going to have a huge effect on that person's ability to have children as an adult," said Clark. "Removal of methylation from the germline during prenatal life leaves the germline cells vulnerable to damage. This leads to a critical question: what protects prenatal germline cells from damage or environmental insult during pregnancy? To answer this question, I've been working to create the first scientific model for the earliest steps in human germline formation." Clark must ensure that the prenatal germ cells she creates in the lab for disease-in-a-dish modeling retain just the right amount of methylation in the right areas so they resemble human prenatal germ cells as closely as possible. In the study, Clark and her team present a detailed 'reference map' that contains hundreds of millions of data points. The reference map can be used to ensure prenatal germ cells created in the lab have the same methylation characteristics as the prenatal germ cells found in a normal human during prenatal life. "This reference map takes the guess work out of making prenatal germline cells from stem cells," said Clark. "Now that we have a high-resolution quantitative analysis of real human germline cells during prenatal life, we can use this information as we make human prenatal germline cells from stem cells for disease-in-a-dish modeling."